Sleek modern styling and durable "All Weather" construction make this a set that you can be proud to display anywhere for any function from a light meal to a family dinner. 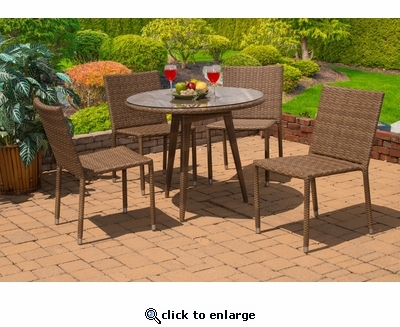 Featuring a double weave of soft polyresin wicker over a sturdy aluminum frame and tempered glass on the dining table, you'll be sure to enjoy this set for years to come. Available in Birch Matte or Bordeaux finish.